Description: Four years after the #994 Camper set was discontinued, Fisher-Price introduced a new, more up-to-date camper in the #992 Car & Camper. The #992 features several exclusives. The set includes a 4-seat jeep with a fold-down back seat and an open roof that the accessory floating boat can fit onto. The foldable camper has a yellow fabric roof that covers 2 double bed sleeping areas, a molded-in table and seats, a sink, and a range. The camper has a fold-down door on the side, 2 rolling wheels on the bottom, and a hitch on the front to connect to the jeep. 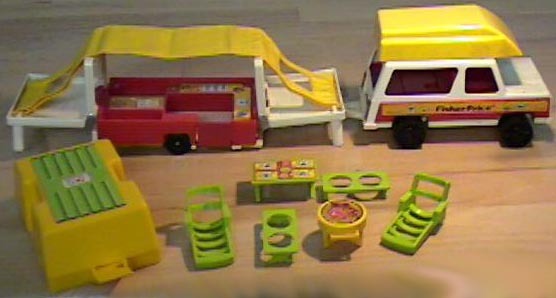 The set also includes a yellow storage container that holds the accessory picnic table, benches, 2 lounge chairs, and grill. This container snaps shut, mounts onto the folded-up camper, and holds the accessory motorcycle on the back ledge. A family of four Original Little People were sold with this set to enjoy the camping trip. FPT866 - Red pop-up tent camper with a white folding top that opens to reveal a yellow fabric tent top inside. When opened, the white side areas serve as sleeping quarters, and the center has a table and seats for 4. The inside also includes a kitchen and fold-down door. When closed, the exterior ends fold in and lay flat. The FPT615 clamshell carrier fits on top of the trailor when it is closed flat. The camper has a hitch on the front to connect to the FPT613 Jeep. FPT615 - Yellow "clamshell" camper top that acts as a storage container and holds the accessory furniture. It fits on top the #992 pop-up trailer, between the 4 posts in the middle of the folded-up trailer. It has a white and green litho on top, and hook on back to hang the accessory motorcycle. FPT613 - White 4-seat Jeep with a red interior and fold-down back seat. The Jeep has a wood-simulated litho on both sides, and rolls on 4 black treaded tires. The accessory boat fits over the roof. FPT569 - Yellow 4-seat boat with Green seats. The boat is rectangular with a slightly raised "lip" on top of the 2 long sides allowing the boat to be stored on top of the FPT613 Jeep. *See Variations below. FPT457 - Red motorcycle with white handle bars that rolls on 2 black deep tread tires. 2 each - FPT157 - Green plastic slatted "beach" lounge chair with short arm rests on the sides and a raised backrest (2 slats high). The bottom of the chair has a THIN rectangular mold WITHOUT the reinforcement rib on inner edge, click here for an example. Both center sides of the frame have a molded circle and half of the circle sticks out from the inner edge of the frame. Measures 2-7/8" long, 1-9/16" wide, 1-3/8". *See "Variations" below. FPT186 - Lime Green large rectangular "picnic table" style table with a FOUR-PLACE STEAK DINNER LITHO on the surface. 2 each - FPT161 - Lime green rectangular plastic picnic bench seat that has two round figure holes on top and two X-shaped legs on the bottom sides. FPT133 - Round yellow plastic "backyard BBQ" style grill with SEPARATE SPINDLE (STRAIGHT) LEGS. Has a lithograph on top of a steak, hamburger, and a hot dog. Has a small plastic handle off to one side. *See "Variations" below. BQPP - Dad - Green body with black heat-stamped hair. FNPP - Mom - Blue body, fancy eyes and a blonde ponytail. EUPP - Boy - Yellow body with a red cap facing forward, freckles, and smiling. GMPP - Girl - Red body, blonde bob with bangs. *See Variations below. FPT568 - Green 4-seat boat with Yellow seats. The boat is rectangular with a slightly raised "lip" on top of the 2 long sides allowing the boat to be stored on top of the FPT613 Jeep. FPT783 - Green plastic slatted "beach" lounge chair with short arm rests on the sides and a raised backrest (2 slats high). The bottom of the chair has a WIDE rectangular mold WITH a reinforcement rib on inner edge, click here for an example. 1980-1981 -FPT133 - Round yellow plastic "backyard BBQ" style grill with SEPARATE SPINDLE (STRAIGHT) LEGS. Has a lithograph on top of a steak, hamburger, and a hot dog. Has a small plastic handle off to one side. 1982-1984 - FPT723 - Round yellow plastic "backyard BBQ" style grill with X-SHAPED CRISS-CROSS STYLE LEGS. Has a lithograph on top of a steak, hamburger, and a hot dog. Has a small plastic handle off to one side. LBPP - The red girl with a blonde bob with bangs could have also had a light or coral red body opposed to a deep red body. GLPP - In the 1983 and 1984 Fisher-Price Dealer Catalogues, the girl has a red body and a light brown sculpted bob. This set was sold in a 18" long, 9-5/8" high, 4-3/8" deep box.